The University of Auckland has, for more than a century, been dedicated to its mission to nurture scholars who will contribute to society by advancing knowledge and imparting it to new generations of students. 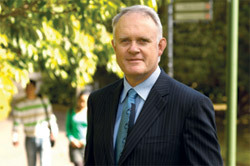 Staff, students and supporters take pride in having contributed to The University of Auckland's reputation as New Zealand's flagship, research-led university, known for the excellence of its teaching, its research, and its service to its local, national and international communities. Society is changing rapidly in ways which will have a profound impact on the role of universities.The 21st century will see, for the first time, a decline in the number of people of working age. This trend, coupled with the changes that innovation brings, will have a major effect on the way people work and the kinds of jobs they do. In a world where change is the norm, however, one thing is certain - knowledge will be a key resource and will be highly sought after within New Zealand and around the globe. The challenge - shared by all universities - is to help to generate the intellectual property which will create new jobs, and to educate and train people to work in fields where they will be valued both for their specialised knowledge, and for their ability to research, communicate and solve problems. Key to meeting these challenges is the need to build on the alliances and collaborative partnerships the University has established with business, industry, government, and other research institutions. These networks, together with the support of alumni and friends here and overseas, are critically important if New Zealand is to realise the full benefits of its investment in the University. It is equally important for the University to keep close to its wider communities of interest within New Zealand and internationally. This will help to ensure the ongoing relevance of our academic programmes and the continued excellence of our teaching, learning and research. In keeping with this philosophy, the University is committed to ensuring that its communities of interest are well informed of its goals and activities. In The University of Auckland Profile 2011-2012, you will find information on the University's teaching and research strengths, its diverse networks and its vibrant, cosmopolitan campuses, which offer so much of life and learning.The University of Auckland is very fortunate to have outstanding staff, students and facilities. Our challenge for the future is to build on this strong base to establish ourselves firmly among the world's leading universities. I hope you will support us in that endeavour. The Times Higher Education publishes the top 400 universities each year. The methodology for calculating rankings is based on 13 indicators across five broad areas of activity: teaching, industry income, citations, research and international outlook. The University of Auckland is the only New Zealand university included in the top 200. Auckland’s ranking of 173 is the same as the University of New South Wales and is sixth highest of all Australian and New Zealand universities. Auckland was ranked in the top 50 universities in two subject areas: Arts and Humanities (43) and Clinical, Pre-Clinical and Health (48).